I love the sound of this creepy horror, releasing this fall just in time for Halloween. When Mouse’s dad asks her to clean out her dead grandmother’s house, she says yes. After all, how bad could it be? Answer: pretty bad. Grandma was a hoarder, and her house is stuffed with useless rubbish. That would be horrific enough, but there’s more—Mouse stumbles across her step-grandfather’s journal, which at first seems to be filled with nonsensical rants…until Mouse encounters some of the terrifying things he described for herself. Alone in the woods with her dog, Mouse finds herself face to face with a series of impossible terrors—because sometimes the things that go bump in the night are real, and they’re looking for you. And if she doesn’t face them head on, she might not survive to tell the tale. 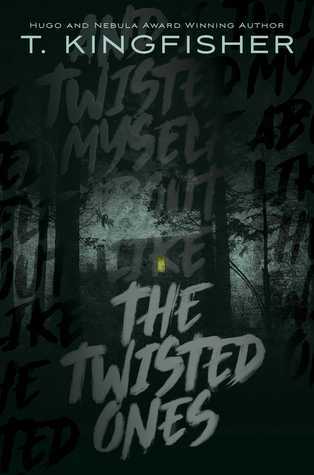 From Hugo Award–winning author Ursula Vernon, writing as T. Kingfisher, The Twisted Ones is a gripping, terrifying tale bound to keep you up all night—from both fear and anticipation of what happens next. Well Mogsy this seems like a frightening read! I had no idea T Kingfisher was Ursula Vernon! I loved Bryony & Roses, that made me cackle so hard. this is a completely different genre and atmosphere, but I’m excited for it! OOoh that one looks eerie!! I like eerie! Hope you enjoy this one once you read it! I read my first T. Kingfisher last year and loved the writing, this one seems pretty interesting but maybe not in my wheelhouse as much as I don’t read a lot of horror these days. Hope you enjoy it! What a great find! I need this one too now. I wanna know what Mouse finds and I love that she has a dog with her – it better not die! However, as I was reading and it stated she stumbled across her step-grandfather’s journal, I initially just read Step-grandfather. That would give the book a whole different twist. “Sometimes the things that go bump in the night are real, and they’re looking for you.” I love that tagline. That, right there, makes me want to give it a read. This sounds good, and it’s new to me so yay for that! Oh this one intrigues me! And this one sounds just perfect… Thanks for sharing! Oh wow this one sounds nice and spooky! I also looked at this one this week – it sounds really good.